It's hard to see everything that's going in the world nowadays and I'm not going to lie, there are days when I prefer to stay away from the news. As a parent I always make sure to talk to my son and remind him that I'm always here for him, no matter what. But I also remember what it's like being a teen and not being able to talk to your parents or family members about everything that's on your mind. That's why it really is great to see companies that care for their community and people of the world, to come together to launch an amazing program that can make a difference in someones life. 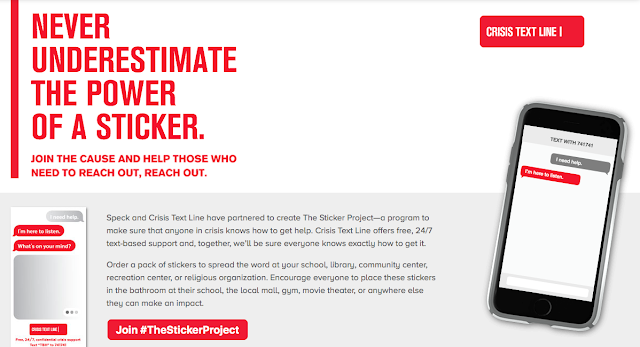 Crisis Text Line & Speck Products have come together to launch The Sticker Project, a nationwide movement to put a sticker for people in crisis in every bathroom in America. “Everyone uses the bathroom. Like, every. Single. Human. Everywhere.,” Lublin (founder of Crisis Text Line) said. “And we want everyone to know that there is free, fast, and anonymous help available if they are in crisis. 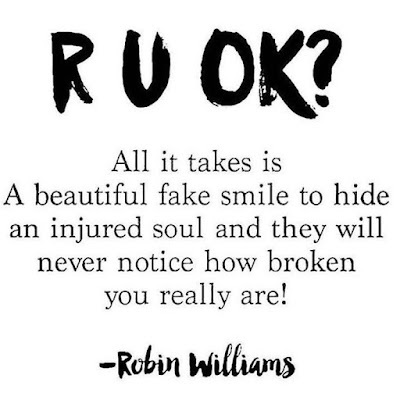 Depression is just one of the factors that can lead a person to make a sad mistake and it's great to be able to have somewhere to turn to and have a listening ear or in this case just a text message away. It can be hard to talk to someone when you don't want to be seen face to face or their are times when talking is not an option. There are times when your inner voice an't be found. The Crisis Text Line is a non-profit organization that provides 24/7 text message support. Over the past 4 years, 45 million messages have been exchanged between people in crisis and more than 3,400 trained volunteer counselors. The stickers are reminder that there is somewhere you can turn to when in need. Stickers are easy to order and free of charge, they can be ordered by schools, counseling centers, youth groups, or any individual who wants to make an impact. I've already ordered a batch that I will be putting up at local places that I visit, such as coffee places, Target and other regular places that I visit, with permission of course. You never know who could see the sticker and the impact it could have on them. Be a part of the movement and share with anyone who might want to order some stickers and make an impact on someones life. To order stickers or learn more about The Sticker Project, visit www.speckproducts.com/thestickerproject. 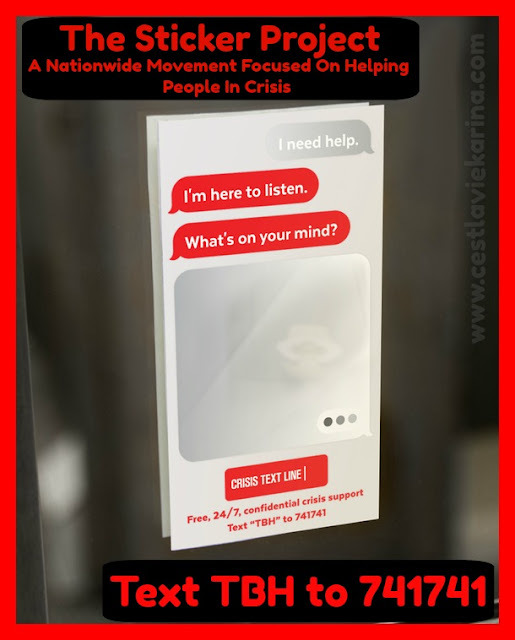 To learn more about Crisis Text Line, become a volunteer or donate, visit www.crisistextline.org. 1 comment on "#TheStickerProject - A Nationwide Movement Focused On Helping People In Crisis"
These are ean excellent idea. Sometimes all someone who is depressed or in a bad place needs is someone to listen. 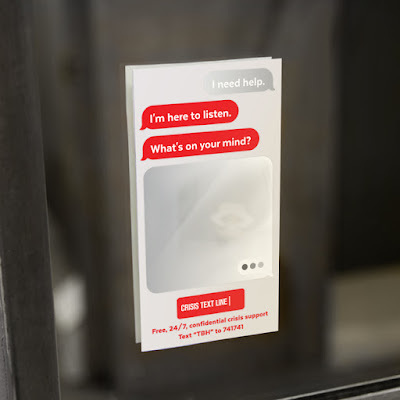 Stickers like these are an excellent way to help such people find help.